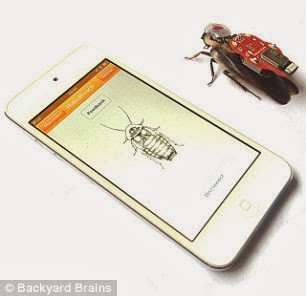 Michigan-based Backyard Brains has officially launched its DIY kits that let people connect living cockroaches to a phone, pictured, and control them using electrical impulses. A DIY kit starts at $99 (£61) for the backpack, but the Android and iOS apps are free. Cockroaches may be considered vermin but one team of scientists has found a way to keep the pests under control - remote control that is. Michigan-based Backyard Brains created an electric backpack that fits onto a cockroach and makes it turn on command using electric impulses, and the firm has now begun selling DIY kits meaning anyone can use the technology at home. 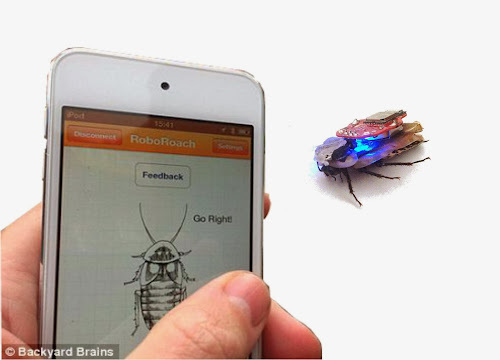 The Roboroach stimulates the creature's antenna and forces it to turn left and right at the flick of a switch and the backpack links with a smartphone app that is used as the remote control. The cockroach's movements are controlled by electrodes that connect to a smartphone via Bluetooth. Its movements are controlled by electrodes that connect to a smartphone via Bluetooth. To attach the backpack, users dip the bug into ice water to 'anaesthetise' it. A patch of shell on its head is sanded and electrodes are stuck to it using superglue. The groundwire is then inserted into the insect’s thorax and the antennae is trimmed so silver electrodes can be placed into them. Its makers claim it would make a great classroom aide to teach children about how the brain works. Although they also insist the cockroaches are treated humanely, they risk a backlash from animal rights activists who say it is cruel. The backpack was announced in 2011 before successfully achieving funding through a Kickstarter campaign this summer. A DIY kit starts at $99 (£61) and Backyard Brains said it will begin shipping them to arrive in November. The previous product from the technology company let students tear the legs off a cockroach to monitor the leg neurotransmissions. The Roboroach is made from a children's toy called the Hexbug, which is a plastic bug that moves around the floor. Engineers from Backyard Brains added chips that give out electric pulses and a harness to secure it to the cockroach’s back. Once in place it takes advantage of the fact that cockroaches turn whenever one of their antenna hits a wall. By sending an electronic pulse from the app through the antenna it is possible to fool them into thinking they need to go left or right. Backyard Brains co-founder Greg Gage said he hoped the device would be used in classrooms to inspire the next generation of neuroscientists. A spokesman from animal charity PETA told MailOnline: 'A recent study by scientists at Queen Mary, University of London found that cockroaches are social beings who 'talk' to one another about food and prefer to dine in groups. 'In an earlier study, researchers used computer simulations to show that insects have enough neural circuits to possess consciousness and that they may even be able to count. To which Cage responded: 'As scientists, we do this all the time, but it happens behind closed doors.